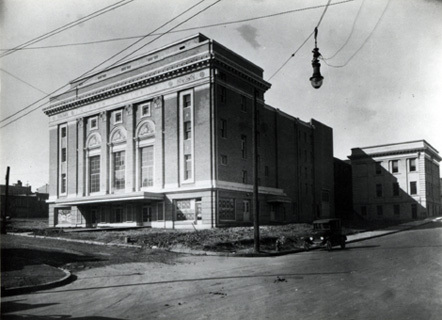 This photograph of the Carolina Theatre was taken shortly after it was completed in 1926, when it was known as the Durham Auditorium. The renowned Washington, D.C., architecture firm Milburn and Heister designed the building, with its elegant Beaux Arts façade. Opening on February 2 with the Kiwanis Jollies, it offered space for public functions and live entertainment such as high school commencements, Miss Durham contests, and national touring attractions. Over the years, stars including Marian Anderson, Lillian Gish, Katherine Hepburn, and Tallulah Bankhead played there. The theater began to show movies in 1929.